With attractive dividends and growth prospects, these energy stocks should be at the top of an investor's buy list right now. World markets have been in turmoil over the past couple of months due to fears that a recession could be just around the corner. That downturn would likely sap demand for energy, which is why energy stocks -- as measured by the Energy Select Sector SPDR ETF, an exchange-traded fund that holds 30 top energy companies -- slumped 20% last year. While a short-term slump could happen, the longer term outlook is much brighter as global energy demand is expected to expand another 25% by 2040, according to the International Energy Agency. That's why investors might want to take advantage of the market's recent sell-off to make a long-term bet on the continued growth of global energy demand. Three energy stocks well-positioned to benefit from this long-term growth trend are Enterprise Products Partners (NYSE:EPD), Royal Dutch Shell (NYSE:RDS-A)(NYSE:RDS-B), and NextEra Energy (NYSE:NEE). Here's why these three fool.com contributors think they're the best ones to buy right now. Matt DiLallo (Enterprise Products Partners): Midstream giant Enterprise Products Partners delivered outstanding operational and financial results through the first nine months of 2018. Volumes flowing through the company's various pipeline networks rose 15% due to both a stronger oil market for most of the year and recently completed expansion projects. This uptick in volumes fueled a more than 30% jump in the company's earnings and cash flow. That's phenomenal growth for such a large pipeline company. However, despite putting up those strong numbers, Enterprise Products Partners' unit price declined about 7% on the year, due mainly to the market's late swoon. Because of that, the company's dividend yield has risen above 7%, while its valuation has fallen to an enticing level of less than 10 times cash flow. Those metrics alone make Enterprise Products Partners a compelling investment option these days. Adding to the attraction, though, is that the company's financial profile and growth prospects have improved throughout the year. For example, its distribution coverage ratio has increased from 1.2 times in 2017 up to an even more comfortable 1.6 times during 2018, while its leverage ratio has improved from a peak of 4.4 times in 2016 down to 3.6 times in 2018. Meanwhile, the company has $6 billion of expansion projects under construction that should keep its earnings and cash flow growing at a healthy pace, and this should give it more than enough fuel to continue increasing its dividend. That combination of financial strength, growth, and yield for a value price makes Enterprise Products Partners one of the top energy stocks to consider buying these days. John Bromels (Royal Dutch Shell): With oil prices slumping to levels not seen since 2017, it's natural for investors to be concerned about putting money into oil and gas stocks right now. After all, with WTI Crude dipping below $50/barrel and Brent Crude below $60/barrel, oil companies -- and their share prices -- are feeling the pinch. However, this may be exactly the right time to invest in oil major Royal Dutch Shell. Shell has been posting monster quarterly results recently, which was natural when oil prices were high. But for investors concerned that the current low price environment might become the new normal, it's helpful to look at how Shell performed during the big oil price slump of 2014-2017. In a word, admirably. Shell managed to get through the slump without cutting its dividend (although it did offer a scrip program for a while, offering shareholders the option to receive their dividends in shares as opposed to cash). It also made the huge acquisition of British gas giant BG Group, which it was able to pick up on the cheap. And finally, the company's downstream operations (refining and marketing), which aren't tied to oil prices, managed to churn out enough cash to allow Shell to get back on its feet. CEO Ben Van Beurden and his management team also deserve a lot of credit for cutting costs to the point that Shell's average breakeven price -- the per-barrel price at which Shell will cover its expenses with nothing left over -- dropped below $40/barrel in 2016. With a best-in-class dividend yield of 6.5% and an excellent track record in weathering oil price slumps, Royal Dutch Shell is a top energy stock for investors to consider, even with oil prices at these levels. Travis Hoium (NextEra Energy): The energy industry is going through a major transition to cleaner, more efficient fuels right now, and utilities are at the center of a difficult struggle. Coal is dying, electricity demand is flat for the first time since the light bulb was invented, and consumers can now produce and store their own energy with solar and batteries. That has forced utilities to adapt their business models or risk going out of business, and NextEra Energy has adapted better than most in the industry, which makes it my top energy stock today. NextEra Energy has transformed its business over the last decade by building a massive fleet of wind and solar assets that generate revenue on long-term contracts to sell electricity to utilities. As of the end of the third quarter, the company had 18 gigawatts (GW) of wind assets and 3 GW of solar assets under its control. These assets help drive nearly a third of the utility's revenue, and that will grow over time as a 28 GW pipeline is built out. NEE Revenue (TTM) data by YCharts. 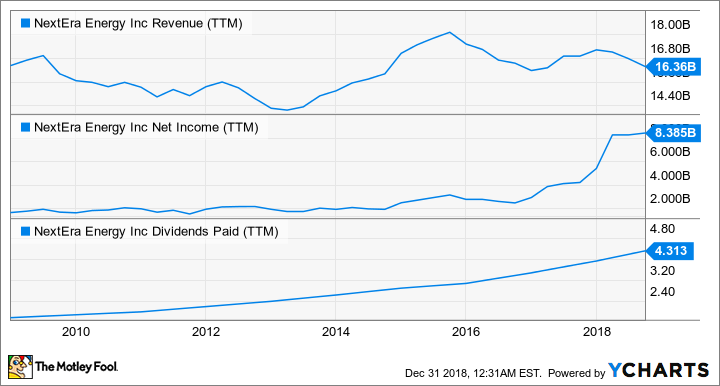 You can see above that NextEra Energy has also remained highly profitable and grown its dividend over the past decade as its renewable energy strategy has unfolded. That's in contrast to some utilities, who have run into operational challenges or even gone bankrupt. Given how well NextEra Energy has navigated the energy landscape and the 2.6% dividend yield the stock holds today, this is a great energy stock to hold long term.